It was the purchase of a particularly gaudy serving platter, I am told, that started it all. Twenty something years ago, my grandparents were visiting my great aunt in Cape Cod where they came across said item at a garage sale in town. When crossing paths again with it the next day, the platter was purchased, and our family’s fate was sealed. 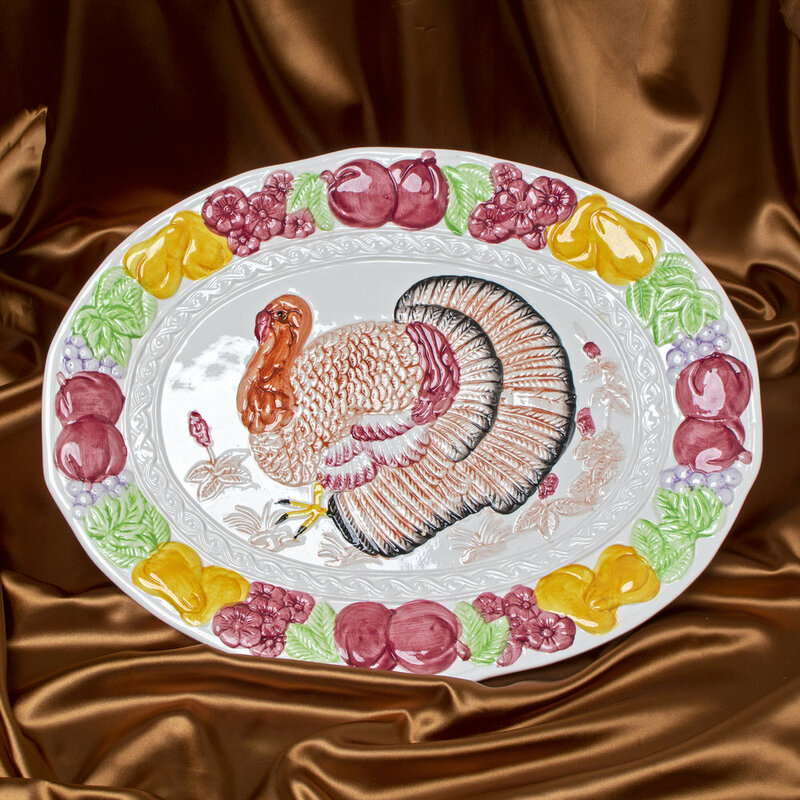 At just over two feet wide, the ceramic platter is bathed in colors all too bright for the vaguely-shaped produce that line its edges. In the center stands a large turkey, whose intricately textured body and feathers adds a considerable amount of height to the platter and, I’d imagine, would make it difficult to keep any main dish arranged in place. It only made sense to be the perfect addition to that year’s Thanksgiving festivities. The following year, there was a new guest, who is now affectionately known as ‘Rico.’ Enrique sports a crudely warm pattern that is curiously consistent across the entirety of his wooden body. With notches for knees, Rico is constantly on the go, as he can be perched almost anywhere in the house (I am sure this is how he maintains his peculiarly slim figure). With a face that only a mother—or in this case, creator—could love, his beady eyes are somehow less jarring than the fact that his snood and wattle are connected in an infinite ring of scarlet obscurity (I’ve learned a lot of technical turkey terms over the years). With him, our longest running family tradition was born. Meet Rico. There is a 60% chance he is actually a chicken, but I’ll leave that up to your own interpretation. As a kid, Thanksgiving was my least favorite holiday. Coming from a family of two religious backgrounds, there was never a question of where we would be spending each holiday (Christmas and Easter with mom’s side every year, and Hanukkah, Passover and then some with my dad’s). Thanksgiving was the anomaly, where we bounced around from family to family depending on whose turn it was each year. Any sense of familiarity was few and far between, which always led to an underwhelming holiday experience for childhood me. Fourteen years ago, my parents took things over, hosting both sides of my family at their house each year in Maryland. What started as a singular meal has now turned into three full days of feasting, complete with a standardized menu for an upwards of thirty guests each night. No amount of food or people, however, can outshine the ever-growing collection of turkeys that have found a permanent home thanks to this newfound consistency in our celebrations. A sampling from our ever-evolving collection. To an outsider, the process is understandably absurd. About a week before Thanksgiving, my father assembles shelves that we own solely for the purpose of displaying these turkey items. My brothers and I carry up nine (going on ten) oversized plastic bins from the basement, leaving them with a small group of cousins, aunts, and grandmothers to unpack. After a few hours, our turkey shrine is assembled, ready for worshipping. Turkey is what our family believes in, and tacky is our religion. The display is composed of eight oversized shelves, generally organized by subject matter that ranges from packaged goods to kitchen appliances to miscellaneous headwear (there is even a whole Hanukkah/Thanksgiving hybrid section from when the two holidays overlapped a few years ago, but that’s for a different time). Across the front of the shelves hangs a row of string lights engulfed by plastic turkey figurines, immersing the entire collection in a warm, comforting glow. If I’m being honest, these shelves are just a small part of the display. What started as one platter has grown into a mighty acquisition that could rival any museum’s permanent collection. When you arrive at my parents’ house, you are greeted by a six foot inflatable light up turkey that sets the tone even before going inside. Amongst the guests, you will start to notice that nearly everyone sports some sort of turkey-themed apparel from their personal collection, from t-shirts to sneakers and, even one year, a belly button ring. From almost every door knob hangs some sort of spillover turkey item, and in the family room, the throw pillows are switched out in favor of more on-theme decor. Just when you think you are safe, you will enter the bathroom only to find it just as tricked out as the room before. From chair backs to table runners to gravy boats and turkey-shaped butters, the dining room only furthers immerses you in all things turkey. I don’t think my family ever intended for things to get so out of hand, but after so many years of collecting, how could we stop now? Our ever-evolving collection shows no signs of stopping. Now, everyone from my old high school friends to members of my grandmother’s quilt guild will mail in any knick-knacks they might find. Per their requests, my family will share photographs of the latest finds with their doctors, hairdressers, neighbors, and coworkers, who are as equally as invested in our efforts as we are. Acquiring these items has become a year-round activity, the pursuit of new items uniting strangers and guests alike. Some families might have more traditional Thanksgiving customs, and we have those too. But, perhaps most importantly, we have these tacky turkeys. As silly as it sounds, this tradition has become a sort of glue that keeps our family gathering year after year. As our family grows in size, and no matter what challenges and differences we might face, an unbreakable bond has formed over collecting these items. They are an amalgamation of the people that my family holds close and the memories and laughs that go along with them (albeit in things as silly as turkey patterned boxers or turkey-shaped pasta).